WHO supports Government to protect over 150,000 population at risk of Yellow fever in Katsina state. Yellow fever is a viral disease, found in tropical regions of Africa and the Americas. The "yellow" in the name refers to the jaundice that affects some patients. It principally affects humans and monkeys, and is transmitted via the bite of Aedes mosquitoes. It can produce devastating outbreaks, which can be prevented and controlled by mass vaccination campaigns. Large scale outbreaks occur every 3 to 10 years in villages or cities in the absence of large scale immunization. Sporadic cases can occur regularly in endemic areas. The incubation period of the virus is 3 to 6 days after a bite from an infected mosquito. About 15% of infections progress to fever and jaundice. While only the minority of cases are severe, case fatality rate may be 25% to 50% among patients with syndrome of haemorrhage, jaundice, and renal disease. Vaccination is the most important preventive measure against yellow fever. The vaccine is safe, affordable and highly effective. A single dose of yellow fever vaccine is sufficient to confer sustained immunity and life-long protection against yellow fever disease and a booster dose of yellow fever vaccine is not needed. The vaccine provides effective immunity within 30 days for 99% of persons vaccinated. 27 countries are at highest risk for yellow fever epidemics in Africa. The burden of yellow fever in Africa is estimated at 84,000–170,000 severe cases and 29,000–60,000 deaths annually. In 2016, during the two-linked urban yellow fever outbreaks – in Angola and DRC – 965 cases were confirmed and around 400 people died. The epidemic created an urgent need for more than 28 million doses of yellow fever vaccines total, which exhausted the existing global vaccine supply. It also diverted public health authorities from tackling other public health issues with an impact on health systems. Additionally, 11 cases were exported to China. Since the launch of the Yellow Fever Initiative in 2006, significant progress in combatting the disease has been made in West Africa and more than 105 million people have been vaccinated in mass campaigns. No outbreaks of yellow fever were reported in West Africa during 2015. Large epidemics of yellow fever occur when infected people introduce the virus into heavily populated areas with high mosquito density and where most people have little or no immunity, due to lack of vaccination. In these conditions, infected mosquitoes transmit the virus from person to person. Yellow fever is difficult to diagnose, especially during the early stages. More severe disease can be confused with severe malaria, leptospirosis, viral hepatitis (especially fulminant forms), other haemorrhagic fevers, infection with other flaviviruses (e.g. dengue haemorrhagic fever), and poisoning. Blood tests (RT-PCR) can sometimes detect the virus in the early stages of the disease. In later stages of the disease, testing to identify antibodies is needed (ELISA and PRNT). The yellow fever vaccine is safe and affordable and a single dose provides life-long protection against yellow fever disease. A booster dose of yellow fever vaccine is not needed. WHO is supporting the roll-out of the preventive mass campaigns by providing technical support to governments in coordination with other partners, and training teams to conduct the large-scale campaigns. WHO is supporting routine immunization by providing guidance on how to integrate Yellow fever vaccination at nine months with the standard measles vaccination to the five countries in Africa that have yet to commit to do this. WHO is supporting countries to increase their surveillance and build a strong laboratory network. WHO is helping to build better national laboratory capacities and expand the laboratory network. Early this year a second laboratory in the region, Uganda Virus Research Institute (UVRI) in Uganda has joined Institut Pasteur Dakar as a WHO regional reference laboratory. 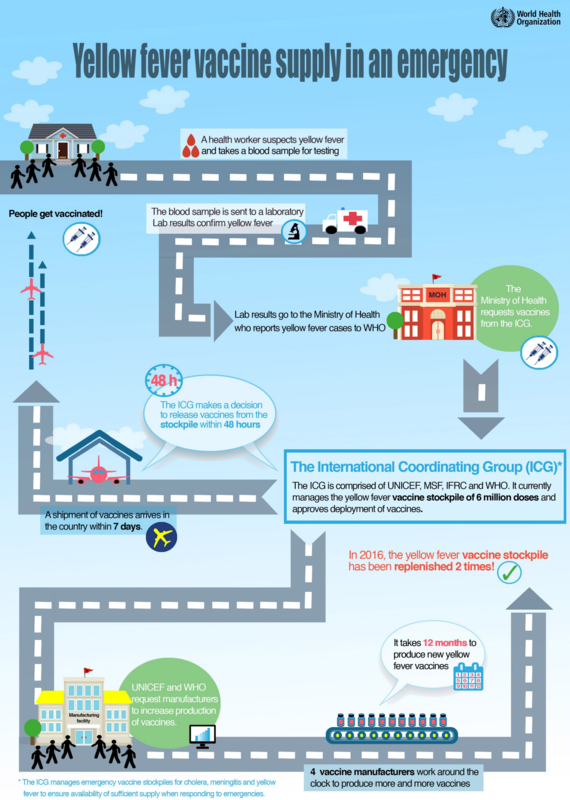 WHO is the Secretariat for the International Coordinating Group for Yellow Fever Vaccine Provision (ICG). The ICG maintains an emergency stockpile of yellow fever vaccines to ensure rapid response to outbreaks in high risk countries. In 2006, the Yellow Fever Initiative was launched to secure global vaccine supply and boost population immunity through vaccination. The Initiative, led by WHO and supported by UNICEF and national governments, has a particular focus on high endemic countries in Africa where the disease is most prominent. Since the Initiative was launched, significant progress has been made in West Africa to bring the disease under control. More than 105 million people have been vaccinated and no yellow fever outbreaks were reported in West Africa during 2015. The Initiative recommends including yellow fever vaccines in routine infant immunizations (starting at age 9 months), implementing mass vaccination campaigns in high-risk areas for all people aged 9 months and older, and maintaining surveillance and outbreak response capacity. Between 2007 and 2016, 14 countries have completed preventive yellow fever vaccination campaigns. The Yellow Fever Initiative is financially supported by the Global Alliance for Vaccines and Immunization (GAVI Alliance), the European Community Humanitarian Office (ECHO), the Central Emergency Response Fund (CERF), ministries of health, and country-level partners. The Eliminate Yellow Fever Epidemics (EYE) Strategy was developed to respond to the increased threat of urban outbreaks of yellow fever with international spread. The EYE strategy aims at building a global coalition of countries and partners to tackle the increased risk of yellow fever epidemics in a coordinated manner and is an opportunity to demonstrate new ways of managing the complex world of re-emerging infectious diseases. No country or institution can tackle the global issue of yellow fever epidemics alone. The EYE partnership is committed to combining its effort to eliminate yellow fever epidemics to main global health agendas, including global health security, health systems strengthening, and universal health coverage. Demand for the yellow fever vaccine has recently increased due to the resurgence of yellow fever epidemics in Africa and Latin America, and the growing number of countries implementing routine immunization programmes. EYE works closely with manufacturers and at-risk countries to ensure vaccines are available in the locations and volume required. Yellow Fever vaccines are currently manufactured by four WHO-prequalified suppliers. Since 2001, annual yellow fever vaccine production has quadrupled from 20 million to 80 million doses. Output is estimated to increase even further in the coming years. The International Coordinating Group (ICG) on Vaccine Provision maintains an emergency stockpile of 6 million doses of yellow fever vaccine, funded by Gavi, which is continually replenished. This mechanism is ready to support countries to implement reactive vaccination campaigns quickly. 27 high-risk countries in Africa need large-scale, preventive vaccination strategies to establish and maintain high levels of immunity among their populations. 23 out of the 27 high-risk countries have introduced routine immunization programmes, which need to be sustained with high immunization coverages. Target population for preventive mass campaigns in Africa is approximately 440 million, requiring 490 million doses of vaccine over ten years. Sustained yellow fever control strategies must rely on strong surveillance and diagnostic capacities to allow for early detection of outbreaks and rapid implementation of control measures that can help mitigate the risk of spread and the use of extensive resources. By end 2018, two WHO regional reference labs are expected to be functional in Africa. Another laboratory in the region will join the Institut Pasteur Dakar to build in-country laboratory capacity by training national labs, confirming yellow fever cases, providing reagents, etc. With a faster and reliable laboratory network, countries will be able to implement faster responses. Steered by WHO, UNICEF, and Gavi, the Vaccine Alliance, EYE supports 40 countries and involves more than 50 partners. The EYE strategy was endorsed by the Strategic Advisory Group of Experts on Immunization (SAGE) in October 2016 and approved by the Gavi Board in December 2016. The strategy will succeed by engaging countries and multidisciplinary partners, and by coordinating efforts well. Four out of the 27 high-risk countries (Ethiopia, South Sudan, Sudan and Uganda) have not yet introduced routine immunization, but it is expected that they do so by the end of 2020. Kenya has already committed to increase the number of counties where routine immunization is introduced.